The tuba is the largest member of the brass family. As with all brass instruments, the sound is produced by buzzing the lips into a mouthpiece. The tuba works the same as a baritone but its twice the length. The unique, low sound of the tuba can be beautiful while playing bass lines or the melody. The stereotype of the tuba, playing oompah, oompah isnt really true at all. When given the opportunity, its a great solo instrument, its just pitched low. Many students who like the tuba start out on the baritone with plans to switch to the tuba after a year or two of band. The baritone is a little easier to manage for most elementary students. Taking care of a tuba is easier than a woodwind instrument and very similar to a trumpet or baritone. It is stored in the case in usually just two pieces or sometimes three. The only regular maintenance required is to oil the valves now and then and grease the slides as needed. The tuba is played with the right hand on the valves. The left arm usually supports the bottom of the instrument. There are a number of shapes and sizes of tubas. Some have vertically angled valves with the mouthpiece attached on the left side of the instrument. Others have diagonally angled valves with the mouthpiece attached on the right side of the instrument. The bell of tubas can be either straight up or bent forward. None of these differences really matter for younger players. Good brands of instruments are made using all of these configurations. Student tubas come in various sizes. The difference is caused by how tightly the tubing is coiled. Although 3/4 sized tubas look much smaller, they are really the same length and the same pitch as the big tubas. The tubing is just coiled tighter. Another version of tuba has a different name. Its called the sousaphone. The sousaphone is known as a marching tuba. It coils around the player with the bell pointing forward. Sousaphones are either made of brass or a white plastic. The difference between sousaphones and tubas is very small. They both play the same notes and use the same valve configuration. Other than the obvious shape difference, the other difference is similar to the difference between a trumpet and cornet. The tubing of the tuba and cornet are more cone shaped or conical than the sousaphone and trumpet. Both tubas and sousaphones are usable for beginners. If the sousaphone is held by a sousaphone chair that supports the instrument, even small beginners can handle it. 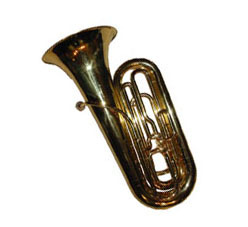 The most popular and best instrument for beginners is a 3/4 student model tuba. Professional level tubas include different sizes and different pitched instruments. They usually include four or even five valves compared to the three valves of a beginning tuba. These include CC tubas, Eb (E flat) tubas and F tubas. Beginners should start with a BBb (double B flat) tuba or sousaphone. The tuba is not nearly as popular as the trumpet or clarinet. Less students performing an instrument means that the competition will not be as fierce. Good tuba players are considered very valuable assets by band teachers since there are so few of them. The tuba can be heard in several different types of groups. They are widely used in in bands, symphony orchestras, jazz groups or as solo instruments. There are several good choices for purchasing a beginning tuba. A good beginning tuba from Giardinelli is the Yamaha YBB-105WC 3/4 tuba. Since tubas are more expensive than most instruments, most schools have tubas available to lend to students. Before you buy, it would be worth asking your band director if school tubas are available. Purchasing a used tuba can be a good option. There isnt a lot that can go wrong with a tuba compared to a woodwind instrument. If the valves move freely and the instrument doesnt have leaks or large dents, it is probably a decent instrument unless its manufactured by a substandard brand. Buying a used instrument is only recommended if you know an advanced tuba player or band director who can test the used instrument before you buy.